By showing off a phone with a flexible screen, Samsung is hinting at a day when we might fold up our large phone or tablet screens as if they were maps. The Korean electronics company provided a glimpse of such a device at a keynote speech Wednesday at the International CES gadget show in Las Vegas. It's an annual showcase of the latest TVs, computers and other consumer-electronic devices. WHAT IT IS: Brian Berkeley, head of Samsung Electronics Co.'s display lab in San Jose, Calif., demonstrated a phone that consists of a matchbox-sized hard enclosure, with a paper-thin, flexible color screen attached to one end. The screen doesn't appear flexible enough to fold in half like a piece of paper, but it could bend into a tube. The company also showed a video of a future concept, with a phone-sized device that opens up like a book, revealing a tablet-sized screen inside. HOW IT WORKS: The screen uses organic light-emitting diodes, or OLEDs. Only a thin layer of these chemicals is needed to produce a bright, colorful screen. They're used in many Samsung phones already, though with glass screens. 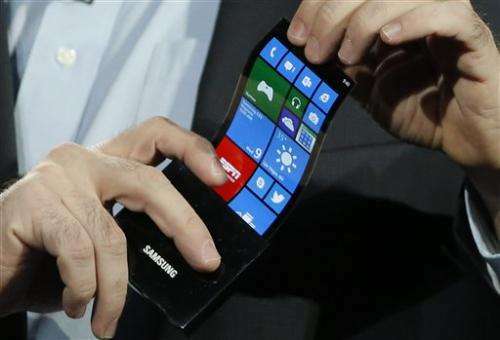 For the bendable phone, Samsung laid the chemicals over thin plastic instead of glass. That's a trick you can't pull off with liquid crystals in standard displays. WHY YOU'D WANT IT: You could pack a bigger screen in your pocket. In a more conventional application, Berkeley demonstrated a phone with a display that's rigid, but bent around the edges of the device, so it can show incoming messages even with a cover over the main screen. In short, OLEDs free designers to make gadgets with curved screens. WHY IT MIGHT NOT WORK: It's tough to use a touch screen if it bends away from your finger. Flexible OLED screens have been demonstrated for years, but the OLED chemicals are extremely sensitive to oxygen, so they need to be completely sealed off from the air. Volume production of flexible displays that remain airtight has so far stumped engineers. Samsung's screens aren't yet flexible enough to fold, just bend. AVAILABILITY: Samsung didn't say anything about when flexible displays might be commercialized. "The concept of the flexible screen has been around for some time, but it finally looks as if Samsung is really going to deliver on that technology," said Steve Bell, a technology consultant and president of KeySo Global. What's clever is that Samsung already has an application for the bendable screen - that scrolling message display on the side of the phone. I can't actually see myself sitting down with a rolled up screen and slapping it down on the desk in front of me to read the news the way that Dr Dave Bowman did in 2001: A Space Odyssey, but it might happen. Will we be keeping our mini iPads rolled up in our pencil holders? Well, why not? Really large flexible flat screens curving on a round wall might give that Cineramascope effect, which might enhance the 3D experience. I suppose that a screen could be programmed with the intuitive knowledge of how curved it is. If, for example, one were to wrap one around a pillar, how would that impact the viewing experience? Could we see the same picture from different viewing angles? There's a wealth of research potential here, but how practical is it? The wrapped screen simplifies manufacturing to some extent since combining multiple display elements may reduce to producing one flexible one. I can see some utility in a cigar shaped cylinder containing a hectically coiled display that can be drawn out of a package like a tape measure. It would provide compact design and protection from damage, although how it would be powered is another question. I can see stick on versions of these kinds of displays becoming commonplace on appliances, giving users feedback and operating instructions. The microwave oven I have sitting on top of my refrigerator has a thin stick on matrix of buttons for it's control. The display however is LED and resides inside the unit - visible through a glass pane. This could be converted to another self adhesive display pad above the self adhesive keypad. If the cost is low enough, the use of small displays like this could become extremely common.